Managing a large family and large family organization are two of the most daunting parts of being a large family mother. When it comes down to it, being pregnant for what feels like forever, dealing with an ongoing cycle of breastfeeding, potty training, and terrible twos and threes, these things aren’t nearly as overwhelming as trying to figure out how to organize a large family household and run it efficiently. Large family home management is kind of my specialty (hence the website name ), but I’m just going to be perfectly honest with you right now. My house does NOT look like a page out of IKEA or the Container Store. It’s not super-hyper organized with everything labeled and perpetually in it’s own place. My large family home is a living, breathing place that is filled with love and chaos, and inevitable mess. However, because I have spent so much time (years and years and years) of managing everything, I have so many large family hacks at my disposal! I know how to quickly whip everything back into ship-shape in hardly any time at all (and I do this several times throughout the day). And I have the perfect place for you to start. I’ve put together a fun freebie for you! My Top 5 Tools That You Need To Get Started Organizing Your Large Family Home Right Now List (How’s that for the longest title ever???). You’ll see where to get it at the bottom of the post! It’s SO important to have a game plan any time you are getting ready to take on a massive project. 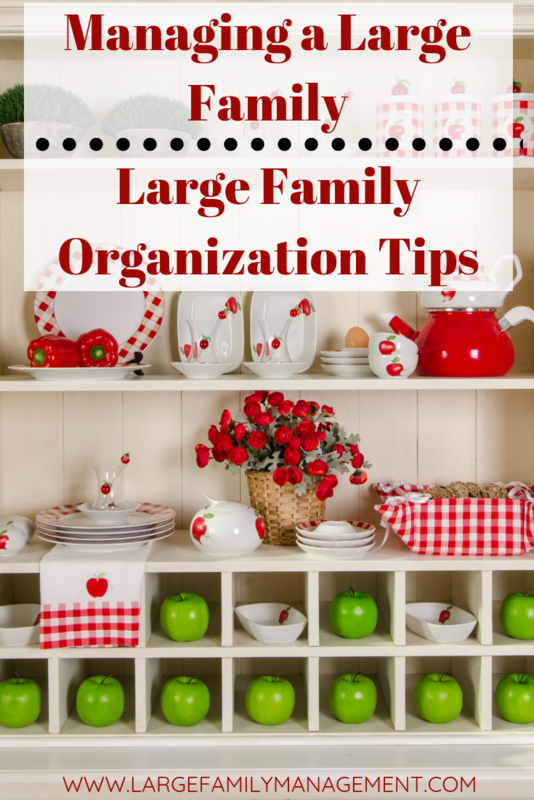 I can’t imagine a more massive project than figuring out how to organize a large family household, can you? You aren’t going to get very far at all if you are approaching large family organizing randomly. I like to call this the Three Pillars of Large Family Organization. The first place you need to start is with a big large family decluttering session. Thankfully, I have created a challenge specifically for this! You can take my FREE 30-Day Large Family Decluttering challenge by signing up here. Once you are starting to get rid of all of the unnecessary stuff in your home, managing everything will be easier. It’s like starting with a clean slate. Don’t wait to start working on these other areas until your home is perfectly decluttered though. Let me tell you a little secret. I am never done decluttering. There is always more! Keep going! Meal planning is one of those make or break activities for managing a large family. If you aren’t doing it regularly, then you are never really sure what you are going to be serving for meals. If you don’t know what you are serving, then you are not managing your home well. I’m sure this sounds harsh, but let me back up just a step. I’m not telling you that you need to serve homemade meals from scratch with only organic ingredients every night. I’m not telling you that, because I don’t do that either. What I’m telling you is that you need to KNOW what you are serving. Even if you need to get take-out every night of the week for whatever reason (and I can think of PLENTY of reasons why you may need to do this! ), I would encourage you to still have a plan for that. So, have a meal plan, and then stick to it! I think I just heard a collective groan. I know, I know. Large family laundry can get oppressive, and it can get oppressive REAL fast. Follow that link up there if you need some help designing your own laundry system. Just remember, the sooner you have a workable plan for keeping your laundry under control, the sooner you will be on your way to really managing your large family home well. Start working today on getting the three pillars of Large Family Organization under control (decluttering, meal planning, laundry). Work on these three pillars every day. Recognize there are seasons to large family life. In the middle of morning sickness, or during those early newborn days are not the time to start an overhaul. Your children are more capable of helping than they let on. Teach them well and then inspect their work (I’ve actually started assigning a few of my older children to be inspectors, and this works SO WELL). Don’t turn into a housekeeping shrew. Recognize that a large family home is never going to be perfect, and if you ever get it to that point, it will not last long. Don’t make everyone miserable trying to attain perfection. Don’t give up. The worst thing that you can do when trying to figure out how to manage a large family is to give up. You’ll have good days and bad days, learn to roll with it. 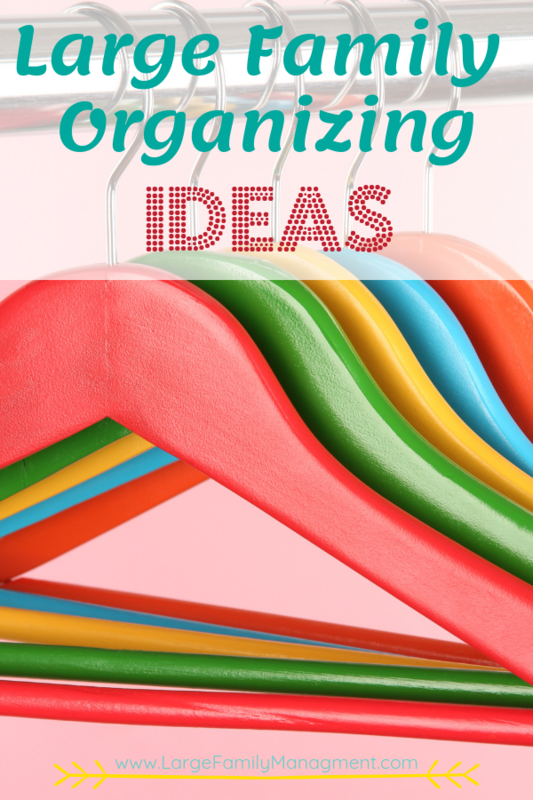 There are a lot of tools available to help you achieve Large Family Home Organization, and I actually go over quite a few of these tools in my Top 5 Tools That You Need To Get Started Organizing Your Large Family Home Right Now List. Some of them will probably surprise you, and none of them are expensive at all. You don’t have to spend tons of money at the Container Store or at IKEA (although, that sure is fun!). You can use what you have right now. Managing a Large Family does NOT require expensive tools. It requires your time, and it requires determination. 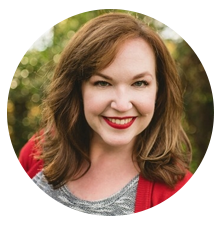 Get the password to my FREE Large Family Resource Library where you can have access to all of my exclusive Large Family Management resources in one place. 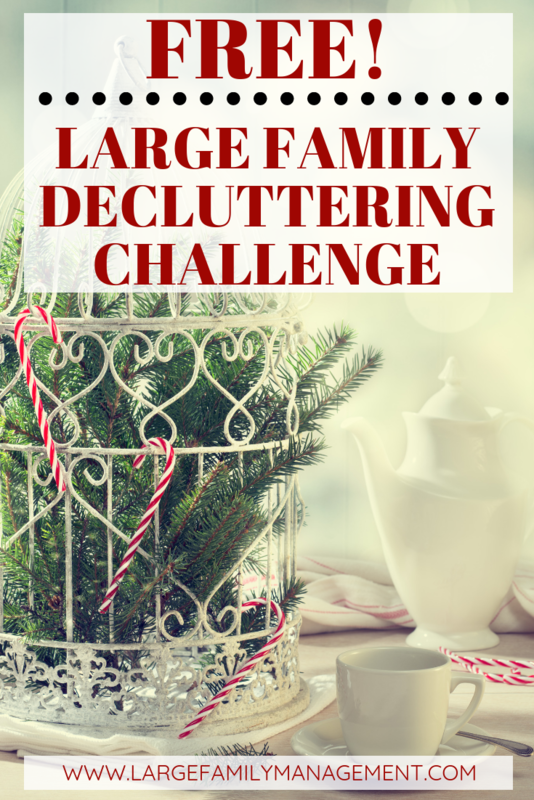 Large Family Decluttering is something I’m always working on…it’s one of those jobs in the same category as large family cooking, large family laundry, and large family homeschooling. Decluttering is just never done. I’ve trained myself over the years to do a little bit of decluttering each day, the same way I do with my large family cleaning and large family laundry stystems. However, I LOVE doing one big large family decluttering push right before I do my spring cleaning each year! This just makes sense. If you are going to be doing a lot of deep cleaning, think about how much easier it is to clean a decluttered space. It takes so much less time, and it’s just a more enjoyable job. 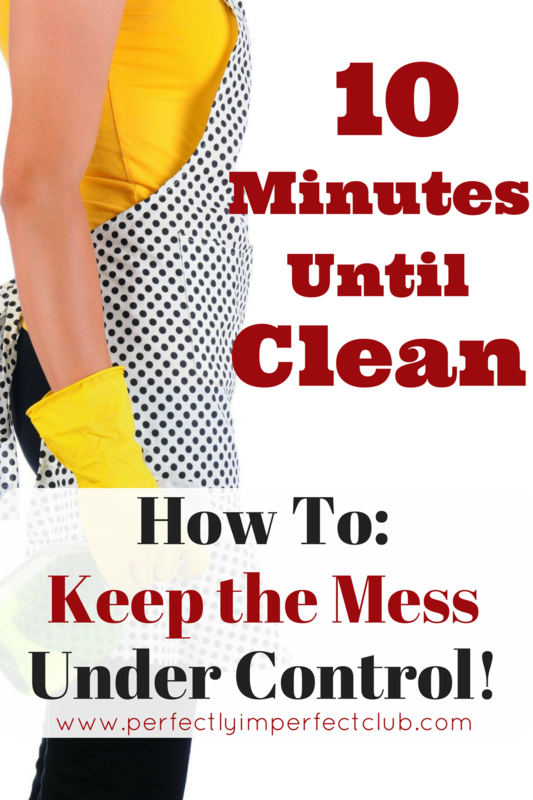 I don’t necessarily enjoy cleaning, so I need to make it as easy on myself as possible. Boy oh boy do I have some tips to share with you today on how to stop a stomach bug from spreading in a large family! We have been through the ringer for the last month! If you read my last post, about surviving times of illness in a large family, then you already know that we have been battling the stomach bug. What you may not know is that we went through this stomach bug for four whole weeks! Eek!!! Everyone in the family (11 of us total) got it, except for my oldest son, and four of us got it twice! Twice!!! I always thought that once you caught it, you were good and wouldn’t get it again that same year. Let me tell you, folks. You CAN get it again! I’m going to share with you today what we did wrong, and then what we finally started doing that ended up containing the virus and getting it out of the house. It was NOT easy. We basically adopted hospital grade sanitation procedures. But it was necessary. And now that I have these procedures, I have some hope that in the future, when we get the stomach bug again, we won’t have it for nearly as long, and we might be able to contain it to just a few people coming down with it. We’ll see. But hopefully not anytime soon! You know the drill. When one person catches a virus, usually at least half of the family ends up affected. Unless it’s the dreaded stomach bug. In our house, if one gets a stomach bug, we all eventually get it!